Industrial water chillers are available as PORTABLE or CENTRAL. This FYI compares some of the differences between portable chillers and central chillers. Portable and central water chillers have their place in the heat transfer market. But if selected improperly or expected to perform beyond design specifications, then issues will arise along with operator frustration. Although Central and Portable liquid process chillers are refrigeration devices for process cooling and heat transfer, they are two different breeds. PORTABLE water chillers are designed to cool one use point. CENTRAL chillers are designed to provide cooling water to an entire facility and servicing multiple use points. Since the objectives of these chillers are radically different, they therefore, are different. In some cases portable chillers can be ‘modified’ with some standard options to act as a central chiller. However, the portable chiller does not and will not provide all the benefits of a central chiller. 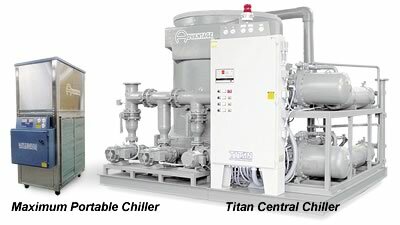 Expand the items below to explore the comparisons between Maximum portable chillers and Titan central chillers. A portable chiller can utilize an outdoor condenser also in lieu of fans or a blower. Installation costs for a portable chiller could be the same as a central chiller is used as a central chiller with multiple use points. For more information about difference between Central and Portable water chillers call the Advantage Sales Department at 317-887-0729. Would you like to Download FYI #265 to your browser?